Let’s cover safety first, since that’s the primary reason these systems are monitored to begin with. The idea with redundant landlines is that if one line fails, the second line is there as a backup. There are some limitations to this “fail safe”, an example of which is as follows: those two c opper lines usually run back to the same telco box via the same conduit channels. If that conduit is severed or that telco box is damaged/destroyed, both of those lines are lost simultaneously along with monitoring. At 12:AM, your monitoring company performs its once-every-24-hours check-in and pings your facility’s fire alarm monitoring unit, receiving a good signal. At 12:02, a tipsy driver just down the road is reading a text message while scratching an itch on his leg and veers over the curb. 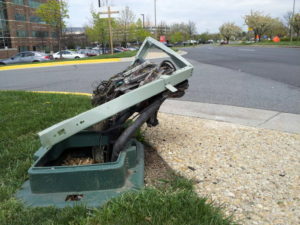 He ends up driving his rapidly depreciating SUV over the telco box that both of those monitoring lines feed into, dragging it half a block away before leaving it, and its contents, next to a storm drain while frantically looking over his shoulders and wondering where his phone is now. From the monitoring company’s perspective, all is still right with the world. Hoping to illustrate Murphy’s Law in action, some bad wiring in your building finally decides to short out and starts to smoke. There’s no fire yet, but the smoke detectors nearby are sending a signal to your fire alarm control panel that there’s a problem. The fire alarm panel is telling the monitoring unit to send an alarm signal to the monitoring company, but that signal is going nowhere. If a fire does ultimately start, which is likely if there is enough smoke to set off a detector, it will progress unchecked until someone either hears the on-site alarm or can see the flames, but there will be no early intervention by the fire department initiated by the monitoring company you are paying to protect your facility. Cellular monitoring units, by contrast, are far more reliable because they check in with a central station every 1.5 minutes and have the redundant connections of multiple cell towers. If that cellular unit fails, the monitoring company will be alerted within 5 minutes and one of our technicians would be onsite to get it fixed within 2 hours*, vastly reducing the exposure to disaster. Each dedicated landline costs about $50/mo. That’s $100/month for two phone lines that sit idle 99.99% of the time. 100X12= $1200/year in landline charges from your phone company! 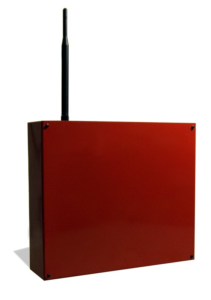 A Cellular monitoring unit costs, on average, $600/year for data. Quick math, that’s $600 savings per year, or HALF the cost! You have long since paid for the cost of the cellular unit and the labor to install it. And the savings continue to pile up. The only loser in this scenario is theoretically the phone company, but it turns out they don’t even want that business. POTS line providers have been pushing for years to make cellular monitoring of fire panels required for new installations and to incentivize replacing current units. Those copper lines are expensive to maintain and they’d rather just phase them all out in favor of digital alternatives. This leads us to one final bonus point: when this technology is finally mandated as a standard, it will get more expensive because demand will increase. Take advantage of the timing and call us today to help you drop those costly, inefficient POTS lines and replace them with a new cellular unit! *Signaling System Solutions commits to the Greater Portland, OR market that we will be on site within 2 hours of any urgent service call, 24 hours per day. If you call someone else, we have no idea how long it will take them.